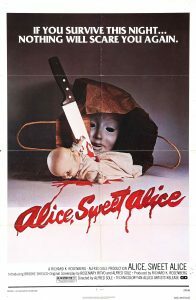 “Alice, Sweet Alice” (aka “Communion”), is an excellent horror film. It was years before “Halloween” and “Friday the 13th”, and for some reason this movie stuck with me. I saw it years ago, and just re-rented it recently, and found it to be better on the second viewing. This film revolves around Alice Spages, a 12 year old girl. She comes from a divorced, strict Catholic family, and her little sister, Karen, gets most of the attention, while Alice is sort of left in the dark. We get the idea that Alice might have some problems and you can surely tell she is jealous of her sister. Then, on Karen’s first holy communion, she is strangled to death and lit on fire in the church by someone wearing a yellow rain slicker and a creepy plastic mask. The police believe Alice had something to do with her sister’s murder, and commit her as their target. Then, the mysterious person in the yellow rain slicker strikes again, this time stabbing Alice’s Aunt while she’s walking down the stairs of an apartment complex. As more murders continue, we begin to question – could a 12 year old girl really be capable of murder? Or could it be someone else? I can say this movie is pretty disturbing, seeing an innocent girl murdered in a church before her first communion is quite sinister. Director Alfred Sole gives the viewer some heavy Catholic imagery throughout the film, contrasting it with the brutal events taking place. There is obviously much thought and detail put into the complex characters, as well as the complicated but intriguing plot. The score is extremely eerie, just listening to the score alone is enough to give anyone the chills. Without the score I think this movie would have lost much of the ambiance that it has. Alice’s sister, Karen, is played by a very young Brooke Shields, and this movie is probably most known for having her name branded on it, even though she dies very soon in the film. Paula Sheppard (who was actually 19 years old at the time) plays Alice, Karen’s violently jealous sister, and her performance is probably the best of the entire film. I absolutely loved the staircase attack on Alice’s aunt, it was unexpected and very well done.